It’s bedtime and you just realized that in the hustle and bustle of the day you forgot to take time out and do your self-Reiki practice. Your eyes are droopy and you chastise yourself for your forgetfulness. So many things had to get done today and you are exhausted. So what do you do when you forget your daily self-Reiki practice? 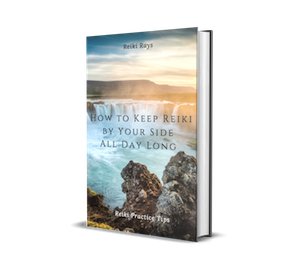 Here are some tips to get you back to Reiki in no time whether it’s just a day or it’s been years. As soon as you realize you forgot Reiki, do it. You don’t have to schedule out 3 hours. You don’t have to be reattuned. You don’t have to go into deep meditation. Take a deep breath and intend Reiki flows. If it is at a time where you can take advantage of giving yourself a full treatment, then do so, but do not beat yourself up if you can’t. Start with a couple of minutes if you need to until you have the time for a full treatment. If it’s right before bed just place your hands where you feel they need to go and go to sleep. You can intend that Reiki flows for your highest good for as long as it is needed while you sleep. If you are not in the position that you can lay or sit for a treatment or even place your hands on yourself, ask that Reiki surrounds you and continue doing what it is you need to. Next, I suggest reviewing the Reiki principles. Place your hands in gassho and recite the principles. Remember that everything is just for today, this minute, this second, this moment. Don’t talk down to yourself because you forgot Reiki. You 10 minutes ago is not You now. Give thanks that you did finally remember. Give thanks that you have Reiki. Give thanks for the principles. Give thanks for this moment. If you have problems remembering to take time for your self-Reiki practice I suggest scheduling the time in every day. Set an alarm on your phone, watch, clock, or computer for the time scheduled if you need to. Have an accountability partner to report to. Find music you really like and can’t wait to listen to. Find the comfiest spot that you can’t wait to melt into. Put notes around your house where you’ll see them to remind you to take time out for your self-care, your Reiki practice. Lastly, examine the reason you forgot or let go of your daily self-Reiki practice. If it’s only been a couple of days did you stop only because you have a busy schedule and you didn’t factor Reiki into it? Don’t forget to start practicing again! If it’s been months or years did Reiki lose its luster for you? What made you stop and what made you come back? Nobody is perfect and everyone is going to forget once in awhile. Don’t beat yourself up if it happens. Just Reiki and move on. If you came back to Reiki after a break I’d love for you to share what brought you back in the comments! Basically your becoming more aware of your surroundings and you are awakening. Just a theory that for me rings true is that you are taking on every body else’s negative vibrations and not disposing of them. In reiki You may need to cut cords. You also need to get grounded and protect your self from psychic attack you need to realignyyour chakras immediately. I have done my masters level III, after that I had many health problems with back, (spinal chord related}, and for more than six months there was ot of problem in controlling my mind and energy level,i was restless, not getting sleep for three four months, bp was very high, i was getting illutions, hearing some strange sounds and so many unimaginable state,unaware of the happenings,memory loss , depression and so many……..problems. Later I took treatment with psychologists, and yoga therapists.It took more than three years to come to normal state. It is not proven and safe to get attuned for higher levels,You start living in fascinated world…rather i advise to practice yoga and pranayama for good health. Thanks for this article I am a level 1 i practiced every day after my attunement but the past few months I have found it hard to focus on myself sometimes. I also have reynauards disease which affects my circulation but I can honestly feel the reiki burning through my hands at times I see this as a definite need to heal myself and start self treatments again. Yes things got much worse for me to, not physically but old skeletons, repressed memories, abuse I have suffered etc. I have stopped also, taking a break for a bit. Its not likely to be the reiki. It could be a combination of things thats causing it. Its possible you may have trapped emotions, maybe inherited ones. I have just released a few of my own via the use of the emotion code. (See Dr Brad Nelson videos on tube). Hi Nina! Why don,t you try the gassho méditation ans recite the gokai for ten minutes daily with only the two hands joined together? Tnx for your reply, let me also try to do some meditations n self healing, but am not even able to continue either self healing or meditations…..I start n do 2 to 3 days it breaks same thing happening from many years now…….Really dnt know wat to do….. I have recently come back to my Reiki self practise after it did a miracle and healed me from a very painful Shingles outbrake. Before, I had bandoned my Reiki practise (Kundalini Reiki) for a while, because it apparently strengthens my psychic abilities so that I would get visions when closing my eyes in meditation or when going to bed. Some images would scare me (e.g. unknown faces). Also, I got the impression to get healing crisis after Reiki practise, especially emotional blockage releases, and although I know that it is a healing sign, it annoyed me. Therefore I decided to just meditate and pray for healing. But when I got a very painful outbreak of Shingles, this and my homeopathic remedies wouldn’t help me enough and I was in such a pain. When I started putting Reiki on my painful upper body, it got better the very minute I sent it. Like a miracle healing. It sent me to sleep when I couldn’t sleep before because of the pain. The next day I could stand up and move again without strong pain. I can definitely recommand Reiki for Shingles! I had been a Reiki 1 Master and had even learned distance healing. And as an Adlerian analyst while I would use my physical touch to heal others, I was reluctant to do it with my clients. I did guide a few of then through doing it on their own bodies while sitting up (since i don’t use the couch. I did use it on my own body. But now it’s been over 20 years since I dd and after watching a video I felt reconnected. When a client today mentioned Reiki. I said Oh, I know how to do Reiki. I used to have business cards to that effect. My question is can I go back to it on my own after such a long time away? Ellen of course you can return to it. If you feel reconnected now is the best time. If you feel unsure may I suggest going to get a session from a Reiki master yourself. This will just boost the flow for you personally and then when you do self healings and healings on others your channels will be open just like they were when you first started. Blessings ? I have been off and on with my self-pracice of Reiki. These comments are very helpful to me, but sometimes I feel as though there is no flow of Reiki and have no one close by to help recharge or realign my chakras. I do identify with many of these comments although I haven’t had the intense illness that many have had, but do have a few health issues with which I cannot afford to see an MD. Namaste and thanks for sharing your thoughts and feelings for all. I stopped using me reiki several years ago after being let down greatly by my 2 reiki masters. I lost all confidence in it and some of the people that were using it not for the highest good. I’ve just this past week or so started using my self healing when I go to bed and using it on my home, car, food, etc and am starting to enjoy it again. I’m now taking each day as it comes with my reiki. I will certainly be more careful in the future who I get involved with.